Brand: bestyles Name :natural pearls &silver necklace/ shell/mother of pearls Pearl size 6mm--12mm Grade: AAA or AA+ 925 silver used, gold can be used. Color can be natural white, pinks or dyed black or yellow. Package: jewlery box,cartons.. pearl shapes can be round, rice, oval etc. Trial or OEM orders are warmly welcome. Lead time: within 7 working days. 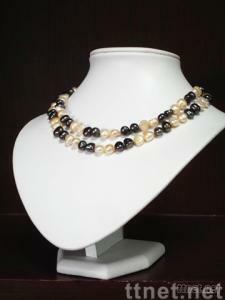 Min order: least 20 pcs per item Other pearl product: necklace, bracelet, pendant, brooches, and other jewelry and accessory.